Stephen Schauwecker from First Southern Bank and Samantha Nelson from Pepsi MidAmerica shared their industry experience and provided valuable insights to management students. Excellence, integrity, access, knowledge creation and innovation: These are the key values of the SIU College of Business. 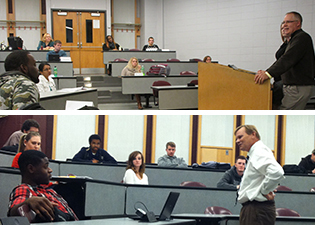 Therefore, connecting business theory taught in the classroom with current industry practice is a crucial part of SIU College of Business students’ classroom experience. One way of providing students with real business lessons is to bring in guest speakers to share their industry knowledge, and to give helpful insights of the workforce outside of SIU. The latest beneficiaries of this real-world knowledge were Dr. Kay Nelson’s management students. She invited Stephen Schauwecker from First Southern Bank and Samantha Nelson from Pepsi MidAmerica to her MGMT 350 Small Business Management and MGMT 474 Managements’ Responsibility in Society classes. “The key is management,” said Schauwecker when speaking to the students during his classroom visit earlier this month about running a successful business. Schauwecker is the co-founder, executive vice president and senior lender of First Southern Bank in Carbondale, the largest bank in Jackson County after a recent merger with The Bank of Marion. Schauwecker vividly engaged the students in an insightful discussion about the necessary elements to start and run a small business. “Small missteps can have a huge impact on credit scores that influence the ability to get a loan in the first place,” he said. Equally important, he said, is understanding the significance of a stringent business plan, as well as the necessity for hiring dedicated and talented employees. “It’s good to have an idea, but it all comes down to how you manage it,” Schauwecker said. The essential ingredient in his recipe of success is the ability to observe, learn and replicate. Further using the specific example of replicating a successful restaurant owner, his last recommendation to the students was to plan a trip to the Small Business Development Center in the very near future. Nelson, from Pepsi MidAmerica, accompanied by Tim Leake, director of training, shared her experience of the transition from the classroom to the professional world. She said her SIU education helped her to master the transition. Six months later, Nelson not only is in charge for the hiring process of the Management Development Program at Pepsi MidAmerica, but she’s also a bearer of great news for current and soon-to-be College of Business graduates. Nelson said the specific qualities is she looking for include a person’s overall personality.